Bratwurst, which is a sausage usually composed of pork, veal or beef, has become my husband's favorite since we got here in the US. We usually eat it grilled with rice or bread and soup, and sometimes with vegetable salad and soup. But yesterday, I thought of cooking it differently. I stir-fried it with potatoes, bell pepper and onions...and added soy sauce and oyster sauce to give it a hint of Asian flavor. Check out the recipe. I'm sure you'll like it...so simple and easy to cook! * I shared this on Melt in Your Mouth Monday, Hearth and Soul Hop, Delectable Tuesday, Tempt My Tummy Tuesday, Tuesdays At The Table, Tasty Tuesdays and Made From Scratch Tuesday. 2 medium-sized potatoes, each cut into 8 pcs. 1. 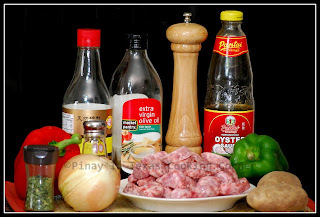 Over medium heat, stir-fry bratwurst in olive oil for about a minute, that is if you are using cooked bratwurst. If not, stir-fry until brown. 2. Add potatoes. Stir-fry until almost cooked. 3. Add bell peppers and onions. Stir fry until cooked but still crunchy. 4. Add oyster sauce, soy sauce and black pepper. Add salt to suit your taste. Mix well. Sprinkle with chives. Simmer for a minute. 5. Transfer to a serving dish. Serve with bread or hot rice! 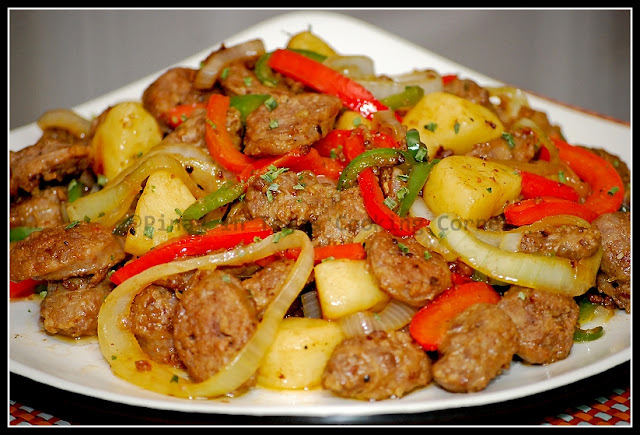 Nice hearty recipe and easy one-pot meal! We eat sausage or chourico, haven't tried bratwurst yet. Looks great and the asian flavors sound wonderful. This looks delicious! I grew up eating Bratwurst, so I love seeing it used in a new way. Thanks for sharing your recipe with us at the Hearth and Soul Hop. I love one pot meals. They make my life so easy! This is a great one! What a fantastic twist! One of my favorite things about blogging is seeing the creative ways cooks use ingredients. It's so fun when someone comes up with new combinations. Thanks so much for sharing at the Hearth and Soul Hop! ah ha when i saw oyster sauce i knew it must be you (: sounds great! I make something similar but not with asian seasoning - I am going to have to try this soon! thanks for sharing this with us at the Hearth and Soul Hop. Lovely Tina although have done something similar but not with bratwurst. Bread will be lovely with this. I love a simple, tasty stir fry ... this looks delicious! that looks great for a fusion-cuisine idea - I love using different sauces. That looks lovely! the grilled onions are just amazing - can almost taste them! Oh my goodness, that sounds absolutely delicious and oh so comforting!